To all at Kimbertal Kennels…. Thank you!!! Zuko is now 7 months old, a little over 80lbs and probably the smartest most loveable dog I have ever known. From the day I picked him up he hasn’t left my side. I literally can’t remember the last time I was able to do anything by myself lol. He’s such a handsome boy that people stop their cars to ask me about him when we go for walks. I even bring him into work to meet my co-workers and at first they are apprehensive because of his size, but then he lays across their lap and they realize he’s just a big lover boy. This dog has been a blessing and I am truly grateful. Thank you so much. Without a doubt all other future four legged members of my family will be from Kimbertal. Hi everyone, We just returned home to NY after 7 weeks and over 5750 miles with our babies,Jade 71/2 and Duke 6 today. We spent time in Florida,New Orleans and Tenn. 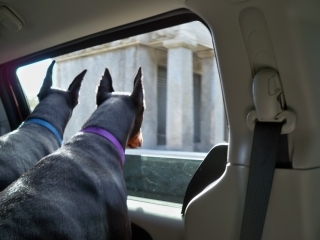 The Dobies were with us the whole time. We had them in the French Quarter in New Orleans. We had so many people stop to see them and as always my Kimbertal babies are well behaved and so good looking. We had them in the Royal Senesta Hotel lobby on Burbon St. Here's a couple of pictures for you. Thanks again for the best!!! Karen E.
Hi Robert Check out Jupiter…..she is AMAZING!! I love her so much! She will be 5 months old next Monday. She’s almost 50lbs. She gets so much attention everywhere I go with her. Been looking at Your Website and the Puppies You have for Sale. Your Internet Special for $1,750.00, Number D 69 J really caught my Eye. Couldn't believe the likeliness that beautiful Boy bares to my Ruger. The Face is as if they were Twins. The same sweet Look in their Eyes, the same Expression. I am not surprised though because they have the same Sire, Iran. He really passes his Looks on to his Offspring. I am so happy with Ruger. Always wrote You the wrong Tatoo No. It's D 51 FF, not F51 as I had referred to. Ruger has acomplished much in his young Age. He was 18 Month Dec. 16th. He was the 'Collector' of Funds this past Summer to have a Safety Entrance put on our existing Dog Park here in Manistee. It was a much needed Safety issue that had not been addressed when the Park was initally build. The Fence is also to low, only Four Feet high, so, we are going to go for a 'large Dog' Section with a minimum of Six, but hopefully Eight Foot Fence next Year. 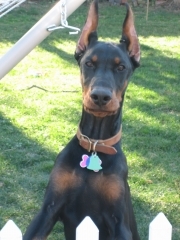 Ruger's best and greatest Achivement however is that he has become the 'Doberman Pinscher Ambassador' for his Breed everywhere we go. He leaves People in Awe of how nice and gentle his Breed truly is. Of course I always interject that he is the Way he is because he was bred and raised right. And they also comment on how good looking he is. And I can't argue that Point either, smile. I just can't Thank You enough for my Ruger Boy. 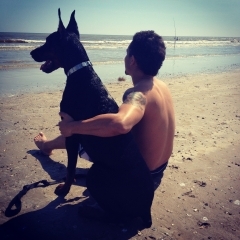 He is sweet and gentle with Dog's and People of all Sizes and Ages but is a fierce Guardian at Home. Did You receive Ruger's Picture with Mr. and Mrs. Santa Claus? I e-mailed it on the 25th., Christmas Day. 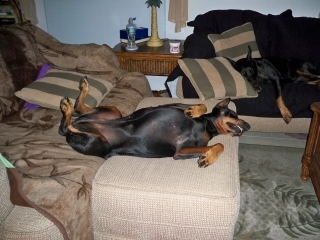 If You did, would You please send me a short Note to let me know what You think of Your Doberman Product? Is he doing You proud and am I doing a good Job keeping him in Top Condition? Your Oppinion is very important to me as I greatly value any of Your Comments. Of course we hope that everyone at Kimbertal had a wonderful Christmas and an even better Year yet ahead. Our most sincerest Wishes for a prosperous, safe, happy and healthy 2012. My Husband, Ruger and I are planning a possible Trip next Year to visit with You sometime late Spring, early Summer. Would let You know in Advance as to when. I truly hope that I am not pestering You with my e-mails, or Ruger's. If I do, please don't hesitate to let me know. I would not be upset. I am just so happy with Ruger and I always think of You and the Kindness You had shown us while there. Merry Christmas to All from me, Ruger (once little F51), here in Michigan. Time has flown by since I left You for my long Trip here. I am now 18 Month old and my Mom says that I am a really good Boy. You can be proud of me. Here is a Picture that was taken Dec. 23rd. with Mr. and Mrs. Santa Claus. Don't know how that Elf snug in the Picture. I hear that some of them can be quite pushy, smile. Mom played the Elf, but let's keep that betwwen us. P.S. Plweaase let us know if You got this e-mail. Thank you!